Phil Knight, the founder of Nike Inc., opens Shoe Dog with the description of a morning run. With that, he instantly connects with the average runner; a sense of camaraderie sets in, and lasts till the last page of the memoir. He’s up at an ungodly hour, laces up, stretches, feels his muscles groan and wake up, and hits the road; basking in the inimitable runners high. On his run, he consolidates his thoughts on what will turn out to be the most important decision of his and scores of runners’ lives, down the years. He decides to talk to his father, his only financier, about starting a company for running shoes. And the rest, as they say, is history. Phil Knight’s partner was the legendary track coach, Bill Bowerman, who coached Phil at University of Oregon, as well as several Olympians, including the great Prefontaine. The company was built on the sweat and blood of shoe dogs, people who are passionate and borderline obsessed with shoes. About running shoes. For years, this company that Phil Knight founded in 1963 was called Blue Ribbon. The story of the change of name to Nike and the design of the logo, the Swoosh, are parts of the memoir that are best left to the reader to enjoy afresh. The company was, essentially, an importer of running shoes from Japan. Onitsuka (ASICS today) was the manufacturer of these shoes. They were, however, conceptualised in America by Bill Bowerman, and later, Johnson, a salesman par excellence, with the help of many a running enthusiast, including stars and rookies in university tracks. The path to self sufficiency in manufacturing shoes is studded with supply troubles and manic enthusiasm of the coterie that formed the core team of the company. It is safe to say that this team that nurtured Nike through its initial days, was built around the onslaught of liquidity crunches and multiple court cases, all of which were life-threatening to the company. For instance, Onitsuka sued Nike in Japan, and Nike sued back in America for breach of contract and trademark infringement. Daily affair for huge companies today, but it could have broken everything that Phil had built. The bad times at Nike went so far as to be notified to the FBI for fraud. This brush with law enforcement was cringe-worthy for anyone rooting for the company (or just for running shoes). As a leader, Phil is disparaging in his take on his role, as he recounts his non-response to enthusiastic members of his team even when they demonstrated utmost dedication to the cause of Nike. Some of them maintained a ledger of the likes of customers, and also went so far as to not cash-in their paychecks. Phil is deeply grateful, though, through negotiations, court cases, and the biannual meetings called Buttface (thus christened to establish how non-conforming to the then corporate standards they were). It would have helped the reader to surmise the same had he described their lives more in depth, though. Of the people that helped to make Nike possible, the role of Phil’s wife, who was their first accountant, is greatly underplayed. She is portrayed as a Mary Sue, with no say whatsoever in any matters. Also, due, in part, to this lack of regard for her part in Phil’s life, or for that matter, for the role that his family may have played, it would be apt to categorise this book as an account of the company, Nike, rather than as a memoir of its founder. In the last chapter, Phil writes about why he wrote the memoir. After all, who really wants to know about the birth and growth of a company that sells “sports stuff”? In a candid couple of pages, he writes that his life’s purpose that has been somewhat realised through Nike, which he sees not as a profit making enterprise, but as a movement towards excellence. The memoir is thus meant to inspire people to start up, believe in their maniacal desires, pursue a calling, and the like. The everyday and the epic in the book, like the daily and personal struggles of the team members, or the geometric year on year increase in annual revenue, prove, surely, that pursuing one’s calling is the the most worthy thing to do. The book gives us the tale of Nike from 1962 to 2006. Some years, however, have unfortunately been brushed over. Today Nike is worth much more than the $8000 annual turn over in 1963. In a way, it’s the story of a do-gooder capitalist, who stands as testament to all that’s well with free markets. One of the most saddening parts of the book, though, was the narration of the “so-called sweatshop” controversy, regarding the abysmal condition of Nike factories in China, Bangladesh. It is outrightly disregarded with deep contempt, rather than acknowledging the humanitarian issue that needed addressing. Nevertheless, since, Nike has risen to become the gold standard of factories in the East. A good comeback, that. As the audience to the book, the slightly more initiated was given far too little to chew on. This is not a quintessential book for runners. Indeed, what would a shoe dog not have given to know more about the shoe designs, or to skim through pictures of the earliest prototypes and products! Neither is the book one for biography buffs. Though the fashionable modernist writing style of writing aided its readability and added to the spark of the book, it felt like it nourished more sound-bites than material. That said, Shoe Dog is an entertaining page-turner for anyone that is willing to engage in a passionate memoir. It widens our understanding of today’s corporate giants. The book is at once the story of the company that tells us that there is no finish line, and a story about winning – with clinical precision and an enduring belief in one’s calling. Just like a professor of the jungle. “I don’t really understand his decisions and choices. It was weird for him choosing to play despite the pain, but he really gave all he had. He gave his best.” – Roger Federer, on Rafael Nadal playing at the Swiss Indoors, Basel, upon recovery from a wrist injury, but with appendicitis. Rafa, the book, is moulded around the 2008 Wimbledon final against Roger Federer. As for how close that match was, how thrilling, I can only tell you that as I watched it Live, my sleep-deprived young heart nearly failed. In Spain, Wimbledon was not a tournament that they wanted their heroes to go after. For the Spanish, Roland Garros was Sanctum Sanctorum, Davis Cup was their Moksha. But they didn’t see that this young man called Rafael from Mallorca would one day stand to be a serious contender of the Championship, not once but more than three times; and each time, the matches were juicy, adding to his glory. Rafa is an awfully contradictory person. He is terrible at making decisions off court, but he nears perfection on court. He cannot function without his family off court, but will do everything in his power to isolate himself from reality and people, in the moments before a match begins in a bizarre ritual (during which he bellows “Vamos! Vamos!” in the changing room; and sprints up and down the cramped space). He works out in the gym with crazy intensity (“each and every time” – this is drilled into you by the time you finish one-third of the book), but he cheats on his diet by eating chocolate cake (his uncle, Toni Nadal, gives him hell for it). The injury department is overcrowded. He has a rare condition in his left foot which forces him to “kill” the foot before he goes to play, because the pain is too great if he does not. Due to this foot condition, the sole of his shoes is an on-going experiment, so as to soften the blow his foot takes; and due to this continuous change in shoe sole shape, other parts of his body suffer injuries (his knee and back). But the guys who treat him make him invincible, despite these bodily failings and his mind makes him the Goliath on court. The book gives you an insight of this. In my opinion, the tenor of the chapters that explain and analyse Rafa’s moves on court at tough situations is the most captivating part of the book. His team is close knit and is very close to Rafa. He is a person who simply cannot live away from his family and team (which he treats like family) for too long. Rafa’s biggest strengths are his parents, his team of physicians and friends and most importantly, Uncle Toni (he’s ruthless, partial against his nephew, crazy about his nephew’s constant improvement (constant vigilance! ), and is often unreasonably critical of his nephew. But he’s immensely loved by this tennis great). 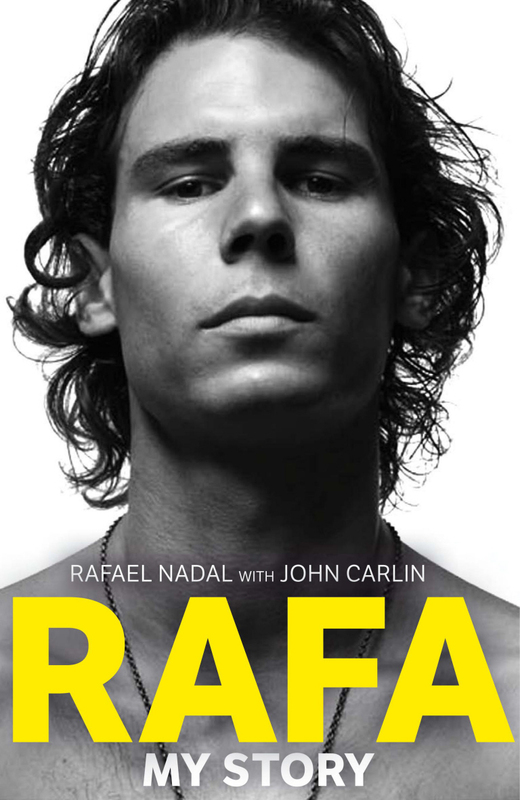 The book shows you how Rafa is a hard working, dedicated, and supremely disciplined tennis player. His modesty is explained the Mallorcan way in the book. His success is attributed to the Nadal family. This is a book for every sportsperson. It teaches you the best kind of lessons about discipline, perseverance, humility, love and hard work.